Milorad Pavic is best known for Dictionary of the Khazars, a novel that was sold in both male and female versions with, I believe, one sentence different. It was followed by Landscape Painted with Tea, a novel structured around the crossword. It is no surprise, therefore, to find that The Inner Side of the Wind is a flip book, presenting the reader with an immediate choice – which story do I read first? Or, more accurately, whose story do I read first, as the novel’s alternative title reveals it to be The Novel of Hero and Leander, and its division takes place along these lines, with one section entitled Hero and the other Leander. The two stories meet in the middle just as the mythical lovers met, Leander swimming across the Hellespont guided by Hero’s lamp. 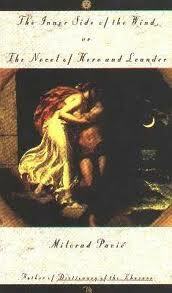 However, you must not imagine that this is something as straight-forward as a retelling of the myth from their separate points of view: neither the Hero nor the Leander of this novel are the lovers of Greek legend; and each half tells a different story, one set in the 17th century, the other in the early 20th. Hero hires herself out as a French tutor, but discovers that, instead of the two children she is contracted to teach, only one appears. This missing child has never been seen by her brother, and soon begins to have an effect on Hero’s ability to teach, making her forget the present tense in favour of the future. This story works well, but only lasts the first chapter before Hero leaves for her brother in Prague. Hero’s story is much more fragmented than Leander’s, containing a story she has written and interpolated into a translation of another text in chapter 2, and changing to a first person narrator, a friend of her brother’s, for chapter 3. Although each chapter works in its own terms, the cuts from one narrative point of view to another serve little purpose, and mean that we do not get the same access to Hero’s character. Despite this, the novel is always entertaining. Pavic’s love of language (“It was as quiet as a freshly washed soul”) and love of story shine through any textual trickery. Danger rating: Books with choices about how you read them are always interesting, and in this case you need only flip a coin. As an aside, some of Pavic’s novels now seem to be available in English as download only – perhaps a sign of things to come. Here, the juxtaposition of the general with the specific creates a jarring comedy: from an accepted truth to a ridiculous example. 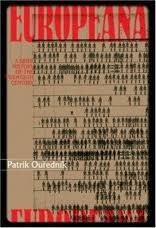 Ourednik focuses largely on the West, and does not attempt, as, for example Eduardo Galeano does in Mirrors, to present a balanced world history. He returns again and again to the First and Second World Wars (the First World War is last mentioned on page 120). But on the way he covers the Barbie doll, the invention of the bicycle, the hippy movement, scientology and psychoanalysis among many other topics. Never has history been so delightful. Danger rating: a hundred years in a couple of hours can be slightly overwhelming, but Europeana is both thought-provoking and entertaining (and great for trivia). When Ismail Kadare won the inaugural Man Booker International Prize in 2005 it was a statement of intent: here was a writer largely unknown in the English speaking world, the kind of name that we normally associate with Nobel Prize (i.e. one we don’t know from a country we wouldn’t want to live in). Cannily, Canongate had recently signed Kadare and published his most recent novel The Successor with some success (sorry) in 2006. This was followed by reissues of some of his older work: the autobiographical Chronicle in Stone, the stories in Agamemnon’s Daughter, and the revised translations of The Siege (previously The Castle) and The Ghost Rider (previously Doruntine). 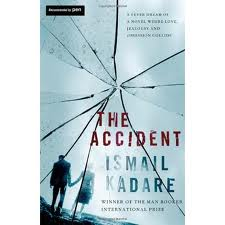 The Accident (originally published in 2008) is Kadare’s first new novel since The Successor, and similarly takes the crime genre as its starting point. For this novel to be regarded as successful it seems to me that one of two things must be assumed. Either it is to be interpreted as a fable (as with much of his work), perhaps exploring the relationship between a person and his or her country, and my lack of expertise in Balkan politics has prevented me from deciphering this. Or it is an examination of paranoia and the pointless interrogation of mysteries where none exist, and the researcher’s occult solution to being unable to arrive at the truth is in the spirit of satire. Neither explanation, however, do I find entirely satisfying. Danger rating: By far Kadare’s most frustrating novel. If you have never read him before (and you should), better to start almost anywhere else. I would recommend The Successor or The Palace of Dreams. 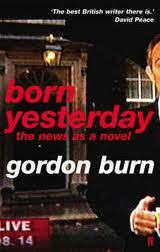 Still on the subject of non-fiction narrative, a more daring example than Zeitoun can be found in Gordon Burn’s Born Yesterday, subtitled ‘the news as a novel’. Published in early 2008, it centred on the major news events of 2007 and was apparently written in a very short period at the end of that year. The events are connected by the ‘character’ of the narrator, who is eventually revealed as Burn through discussion of his novel Fullalove. While this narrator is portrayed in various settings, there is no story as such – the most narrative friendly moment is when he attempts to visit Gordon Brown’s house in North Queensferry, when the novel does become briefly more akin to journalism. For the large part, however, it is a rumination on news, media and celebrity, drawing connections across its cast of real-life characters. At other times Burn over-reaches himself in his search for connections, for example in the pages devoted to Madeleine’s eyes, “stylised into media emblems”, through suspect Robert Murat’s similar defect, to Blair’s “bonkers eye” as depicted by cartoonist Steve Bell, to Gordon Brown “lying immobile in a darkened room to save the sight of what is now considered his ‘good’ right eye”, and, finally, to Damien Hirst. It’s not that this aspect of the novel isn’t interesting, it’s simply isn’t all that meaningful, unless we are to take it symbolic of the media’s narrow vision. Danger rating: ironically, the novel feeds off the very fascination with celebrity that it examines. While not quite tomorrow’s fish and chip paper, the more time passes, and the news stories it echoes fade from view, the less interesting it may become. You are currently browsing the 1streading's Blog blog archives for June, 2011.